Contains premium organic and wild-crafted: Tarragon, Juniper Berry, Geranium, Cardamom, Spearmint, Lemon, Eucalyptus (R), Thyme, Grapefruit, Cardamom, and Holy Basil essential oils. Yang™ blend is part of our Meridian Aromatic Touch Modality™ which focuses on the freeing up the flow of energy throughout the body. 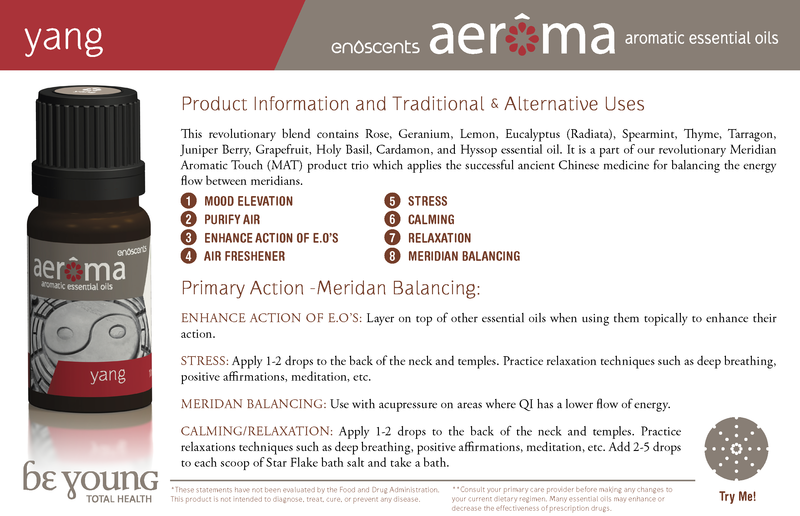 Yang™ blend was specifically formulated to increase meridian energy in areas where there is an insufficiency of energy. Apply 1-2 drops topically on an underactive meridian area. Using Yang Blend with any other oil will help to increase the action of that essential oil.